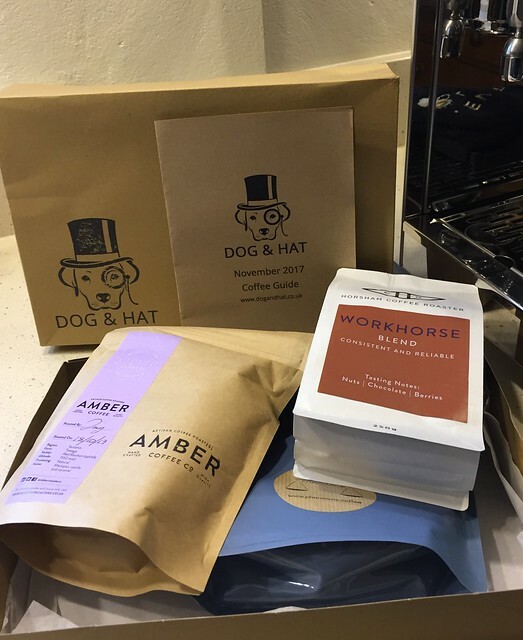 Dog and Hat are a new multi roaster subscription service, we send different coffee from different roasters every month. Visit www.dogandhat.co.uk for full details. We have Founder Members Club, Founder Members enjoy reduced membership rates, special coffee treats and will always be acknowledged for their support in our start-up phase. The Founder Member subscription to the Coffee Lovers Club will close on the 20th December 2017. Then we will open the Coffee Lovers Club at standard rate. Coffee Forum member can grab a free coffee when they order, combined with the Founder Member offers they can get another! Make sure you view the offers page on the website. Amendment - we have had to close orders on the 14th as the Roasters wanted the orders for this the shipment pre Christmas. We did order extra but that has now sold out also. If you were waiting until the 20th then please drop me a line and I will confirm if we can add you to Founder Member with a first subscription of February. That's a really nice touch. I was just about to come on to post a pic of my delivery today! I am really glad you started this thread! The Founder Member subscription to the Coffee Lovers Club will close on the 20th December 2017. Then we will open the Coffee Lovers Club standard at rate. Couldn't resist this, looks great! Just so I understand, will us 'early adopters' continue to get our subscriptions at £14 pm or will it rise to the standard rate? Lelit Mara PL62 / HG-1 / Eazytamp / sweetcorn skewer / completely healthy relationship with coffee (and bank manager). I had emailed them about the extra beans and discount and asked this question within that email. Us early adopters will remain at £14, I love both the multiple roaster model and the way they have rewarded early adopters and us with a passion for coffee. Have also signed up. Looking forward to my first delivery in December. Thanks for the forum discount. I'm signed up and hope to experience and enjoy some new beans along the way.